Well, what can I say but there was a lot of totty at the Fling. A big thank you to all the men who ran without their tops on it was very much appreciated by the marshalls at Beinglas. The Fling was a great weekend. Unfortunately, there was parking issues but it got sorted and Murdo is already looking for ways to improve the situation. It was nice to be out on the course and see family members during the race. At WHWR I am indoors so it was good to be outdoors and soak up the atmosphere. It was good to be able to see DQ and make sure he was hydrated, fed and feeling fine. 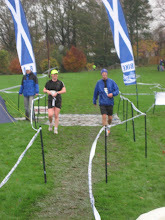 I feel bad that I can't be race support for Mark as I am marshall at the fling, race control at Cateran and WHWR. I would like to be there for him but I love helping at the races and can't imagine not doing it. It will be hard being unable to be support him during WHWR and I am concerned that I will not have time to even check on him as it is so hectic being race control. 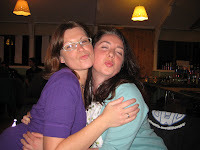 The ceilidh was good fun at night and it was great being able to catch up with everyone. My head was a little tender on the Sunday morning as the hall served the wine in half pint glasses and Pirate boy was in charge of the rounds! Not the piccy I was expecting. I thought it was gonna be you-know-who. But gorgeous all the same. We are pretty hot aint we lol.